We value our people and are committed to providing a safe, supportive and stimulating environment that encourages employees to perform at their best and contribute to the success of the business. Our workforce is made up of close to 1,000 permanent, fixed term and casual employees and independent/individual contractors. Of this group, nearly 50% are based in Victoria; 23% in NSW; 21% in Queensland and 6% in USA with 54% male and 46% female employees across the Group. The majority of our workforce (70.4%) is aged between 30-50 years with 12.6% under 30 years and 17% over 50 years. <?xml:namespace prefix = w />Our Values drive our culture, enable the delivery of our strategy and provide a framework in which decisions are made. Each of these values has been communicated with accompanying specific behaviours. They are the focus of individuals, team managers and senior leaders across our business. These values are also underpinned by the principles of safety, sustainability and diversity. We conduct annual health check activities to ensure our values remain embedded in everything we do and incorporate these as a part of our performance review process ensuring we are accountable for not just what we do but how we achieve outcomes. 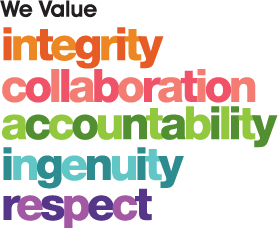 Our values framework was formally launched to the newly joined Queensland business in July 2014. We recognise our employees for living our values with quarterly awards for Safety, Diversity, Customer, Ingenuity, Sustainability and Excellence. In October 2014, the inaugural Annual Awards event was held in Melbourne, with winners from the quarterly awards throughout the year as nominees. The Annual Awards are just one of the ways we recognise and reward our employees for exceptional performance and living our values. In October 2014 we completed our annual Employee Opinion Survey (EOS) to gather feedback and understand how we are tracking across a range of topics. We had a participation rate of 88 per cent (4 per cent higher than the previous year), and 80 per cent of employees said they were proud to work for Transurban. Our overall employee engagement score remained steady at 68 per cent. Survey feedback continues to demonstrate that diversity, safety and our vision and values are well supported, along with a belief in the strategy and vision. We have made some progress in areas such as the response to the survey itself, development and career opportunities, change management and reward and recognition but strive to further strengthen our performance in these areas. Following the Group-wide survey, Executive Committee members hosted team focus sessions to review and discuss the results for each business unit in more detail. Action plans were then developed, giving everyone an opportunity to contribute to improvements. A follow-up ‘Pulse’ survey was conducted in May 2015 to gather feedback on how we had progressed since the Employee Opinion Survey. For the first time, the Queensland business was included in this ‘Pulse’ survey. Transurban’s size and organisational structure provides opportunities for an open and collaborative workplace. Our recent office refurbishments and open-plan layouts play a part in encouraging a working environment where senior leaders are approachable and accessible, sitting among their teams. Quarterly Business Updates are held in each of our offices to keep all employees informed of key business milestones and progress. The meetings feature presentations from Executive Committee (ExCo) members and an open forum for questions and discussion. In addition, there is an ‘Ask ExCo’ email address providing all employees with an open channel for questions and communication to be addressed directly or via these quarterly updates. The Executive Committee also host focus groups throughout the year. Other opportunities for engagement include ‘Fireside chats’ and ‘Coffee with ExCo’ meetings with a randomly chosen group of employees having the chance to sit down and talk to senior executives over coffee on a regular basis. Each of these elements includes a number of regular activities and resources such as information sessions, professional advice, flexible workplace arrangements, recognition programs and volunteering opportunities. A Wellbeing Week was held in September 2014 to launch the program, with each day of the week focusing on a particular element. The Wellbeing program will continue to develop based on feedback and participation. Our Board and workforce are made up of individuals with diverse skills, values, backgrounds, experiences and needs. We value this diversity and recognise the strength, opportunities for innovation and many other benefits that an inclusive and diverse workforce brings. We are committed to providing an environment in which all employees are treated with fairness and respect, and have equal access to opportunities at work. We have, and will continue to develop practices, programs and initiatives to support and assist with improving diversity at all levels of the business. We understand that diversity of thought facilitates successful decision making and high employee engagement. To ensure a continuous focus on diversity and inclusion we have a Group wide Diversity Committee, which meets quarterly. The Committee is chaired by the CEO and sets the Diversity strategy, monitors progress towards achieving our diversity objectives and reviews the work being undertaken. The Committee aims to ensure that we promote and manage a culture that values the differences that all employees and communities bring to the Group. The Diversity Committee has identified three key areas of focus – gender, culture and flexible working arrangements. To support these areas, working groups have been formed and each is sponsored by a member of the Executive Committee. Employees from across the business participate in these working groups which meet monthly and report back to the broader committee. Each year the Diversity Committee sets and agrees objectives for the upcoming financial year in conjunction with the Board. The objectives reflect our three key areas of focus and this year have been expanded to include specific objectives for our US business in regards to the employment of veterans and people who identify as having a disability. The achievement of these objectives is tracked and reported to the Board annually. Transurban is committed to promoting and improving gender equality through our diversity initiatives. One way we communicate this is by reporting each year to the Workplace Gender Equality Agency (WGEA). In FY15, we submitted WGEA compliance reports for Transurban and Transurban Queensland and both entities have been certified as complying with the requirements as set out by the WGEA. 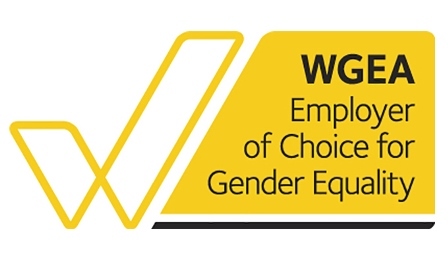 Transurban was awarded the WGEA Employer of Choice for Gender Equality citation. This important accreditation was awarded to 76 organisations in Australia and Transurban was the only company in the transport sector to receive this award. WGEA noted that this is an impressive achievement that recognises excellence in the area of gender diversity and provides the Group with tangible advantages as an employer in the marketplace. The citation is the culmination of our commitment to embed the programs that support gender equality across Transurban. We have a robust parental leave program that includes twelve weeks paid maternity leave and up to forty weeks unpaid; as well as two weeks additional pay on return (paid after three months return). Two weeks paid and one week unpaid paternity leave is provided and can be taken concurrently with the partner’s maternity leave. Thirty-four employees took maternity leave and thirty-two took paternity leave in FY15. Our return to work rate for maternity leave was 78%. We know how important it is to balance professional and personal commitments. We provide a range of flexible work options and support tools that meet the needs of our employees through the different phases of their lives and careers, while ensuring we continue to achieve our business objectives. We recognise that our workforce needs to reflect our customers and the communities that we work within, and therefore we are committed to recruiting and retaining a culturally diverse workforce. We celebrate the diversity of our workforce through recognising festivals of cultural significance and use these events as an opportunity to promote better understanding of these cultural groups. Our Reconciliation Action Plan (RAP) demonstrates our support for Indigenous Australians. It explores how we can contribute to improving the standard of living of Aboriginal and Torres Strait Islander peoples, build positive relationships with Indigenous communities and raise awareness of their history and culture. Our reconciliation effort is managed by a working group of RAP champions from across the business. Transurban is committed to the ongoing development of all our employees. Opportunities to learn at Transurban come in many different forms such as on the job training, mentoring, coaching, secondments and opportunities to be involved in various learning and development programs. We believe in an integrated learning approach and combine on-the-job experience, mentoring and formal training to develop our employees’ skills. Employees are encouraged to use a variety of methods to extend their knowledge, learn new skills and challenge their existing attitudes and behaviours. In FY15, the average amount of training each employee received was 17.1 hours which is an increase from previous years. Transurban supports and encourages employees to undertake tertiary education related to their specific work discipline or future career path within the Group and may, upon application, offer study leave and financial assistance to those employees committed to these sources of learning. Programs are aligned to the various levels and capability requirements of the business. This includes specific development for our senior leader group by way of an annual program with quarterly activities. The over-arching theme for the Senior Leader Program is continued high performance which is then cascaded to all people leaders through our partnership with Melbourne Business School. Identifying and developing talent across the business is a key focus. A bi-annual Talent Review is conducted with the Executive Committee with input from across the Group by way of regular ‘People Days’ that focus on capability requirements, capability gap identification, critical skills and successors. The Diversity Committee developed the Females Encouraged in Engineering and Technology (FEET) mentoring program in FY15 to identify female university students and promote these career paths. Students spend time with a mentor and meet with key members of the business including an Executive Committee member. The FEET mentoring program has a two-fold purpose. Not only does it encourage female students to continue with their studies in engineering or technology by giving them exposure and experience in the industry, but it also allows us to engage with upcoming professionals and potentially recruit the top female talent. In FY15, eleven students were placed in New South Wales and Victoria in engineering and technology areas of the business. The program will expand to Queensland for FY16. Two students from this cohort have progressed to further employment with Transurban. In addition, the NSW Operations and Maintenance (NSW O&M) business unit invited a team of five interns from the University of Western Sydney and Transurban’s FEET program to participate in project work for the Hills M2 and Lane Cove Tunnel assets. Through the program NSW O&M has identified new talent and provided experience and growth opportunities for graduates; forging connections with local universities in north-west Sydney. As part of our commitment to the cultural diversity program and Reconciliation Action Plan, we hosted four Aboriginal and Torres Strait Islander (ATSI) student interns over the university summer break in Sydney and Melbourne as part of the CareerTrackers program. CareerTrackers is a national not-for-profit organisation that provides private sector internship opportunities for talented ATSI students. It was our first year participating in the program. In December 2014, eight students from a range of courses at Monash University joined our Melbourne workplace for a twelve-week internship initiative, providing valuable work experience for the students and allowing Transurban to collaborate with the university community. The students worked in two project teams and were tasked with using their fresh perspectives and academic skills to devise innovative ideas and solutions for our business. One team worked within our Project Delivery and Operational Excellence business unit, exploring communication tools to improve business safety performance. The highlight for the team was seeing their safety campaign come to life at a CityLink display at the Moonee Valley Festival. Another team placed within our Customer Operations business unit sought to optimise the customer experience with our digital interfaces. The highlight for the team was attending a customer focus group and hearing first-hand from our customers about their experiences. Our most significant organisational change in FY15 was the integration of Queensland Motorways. An integration program was established with a dedicated team to manage the transition across eight streams covering all aspects of the business: customers, finance, road operations, major projects, people, communications and stakeholders, legal, and technology. The formal integration program was completed in July 2015 and included the consolidation of a number of policies, programs and systems in an effort to ensure Transurban Queensland is consistent and connected with the Transurban Group. An organisational review to align the Queensland business to the Transurban matrix operating model resulted in 159 employees exiting through voluntary redundancy this year; primarily in the Customer Operations area. A formal consultation process was undertaken with impacted employees prior to the change and career transition services and the employee assistance program were provided to support employees impacted by the change.